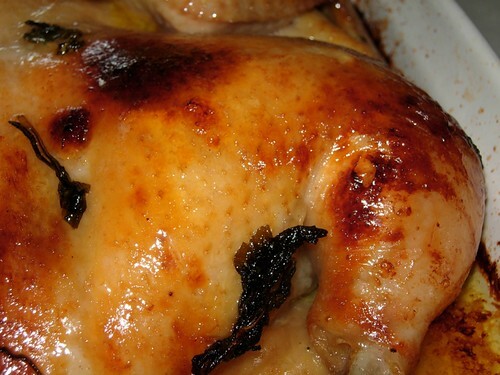 A lot of people are turned off with the chore of roasting a whole chicken because most times, they find it so difficult to get the whole chicken to cook thoroughly. I think it is common to either undercook the chicken or over cooking it. Undercooking means we will get the horrifying blood oozing out of the chicken when we serve them. Overcooking means we are serving a piece of cardboard. So, if you wish to roast chicken but is not confident enough of getting a perfectly cooked chicken, you can try this method. I will get the chicken seller to cut the chicken open by slicing it at the breast part. Then, place the chicken like what you see above. During roasting, all the parts of the chicken will be cooked at around the same temperature as the surface area is exposed. 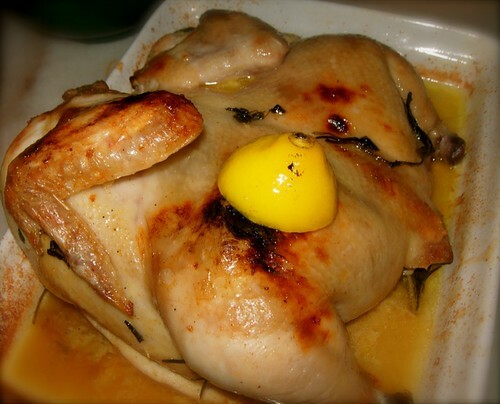 Whereas, if you roast a whole chicken, sometimes the part at the bottom is not cooked. If parts of the chicken is browning faster than the rest, merely place some aluminium foil on the part or like me, I shield it with a bit of lemon. Roasting chicken needs a bit of juggling but the effort is worth it. One cannot just put the chicken into the oven, turn to the correct temperature and return 1 hour later and expect a perfectly done chicken. Those things happen only in oven advertisements. In our homes, we need to watch over the chicken, see that it is not burnt or undercooked. To know if the chicken is cooked through, just take a skewer or chopstick and poke those parts which are meatiest. If not blood ooze out, it is cooked. When the main parts of the chicken have been eaten, there are still meat attached to the bones. I love to tear off those meat and make a chicken salad with it. 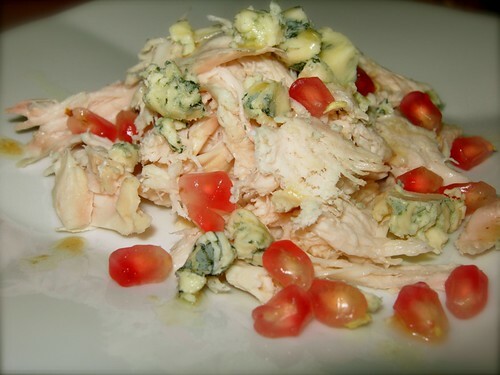 The other day, I use blue cheese and pomegranate.